AKAI EWI3000m Analog Wind Controller – Thinking outside the box! I must mention that I am COMPLETELY new at using a wind instrument. I have a fascination for the synth aspect and the idea of using my breath to control synths in a unique way. As the title here says, I like to think outside the box and have always been curious how someone with ZERO experience on a wind controller could do something fun with it. Today, I was pleased to find that I did’t have to be a Wind Controller expert to have fun with the Akai EWI3000 and make music. I bought the Akai EWI3000 and module used this week along with manuals, cable, and adapter. Everything with this unit is rare to say the least. You can’t find a manual anywhere on the web that’s not Japanese. That’s not a problem for me, but it is for everyone else I know. The adapter is a 15 Volt which is also not very common. Plus the cable itself I’ve heard is rare or expensive if you break it. So I felt lucky that I could get everything in excellent condition. 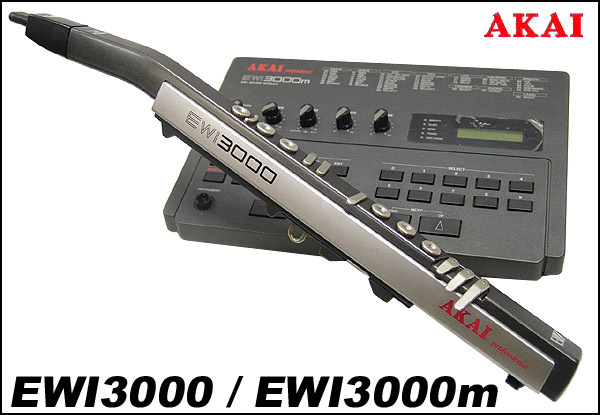 The Akai EWI3000 is often talked about, but for some reason there is no info to be found anywhere about it other than at pPtchman Music. Thank goodness for Patchman Music! The EWI3000m is an Analog Synth. It sounds very impressive to me and I absolutely “Love” the sync and bass sounds this thing makes. Oh man, this really is a nice sounding analog machine. The battery was low so I had to replace it which required soldering in a battery holder. I then had to scour the web for the reset procedure which I finally found after reading a lengthy FAQ. Patchman needs to either condense or organize that thing a bit. No wonder people ask on the forums and don’t read the FAQ. With that said, I’m VERY grateful he had the procedure there because like the Roland Alpha Juno 2, when you replace the battery, the system is whacked until you reset the unit. Now the Akai EWI3000m oozes with Analog sweetness. Having no experience with an AKAI EWI3000 or a Wind Controller I feel is a good thing. I’ve read that often Wind Players have to re-learn how to do things a bit when playing either the Akai or Yamaha wind controller. Since I’m completely new, that means I can just jump in and not worry too much about being confusing. This is why I can say that for me, the AKAI EWI3000 is not hard at all to learn. Sure, as a keyboardist and guitarist, I have to learn how to play scales on a Wind Controller and get my breathing down, but for simple stuff ( like a recorder ), it’s not that difficult to pick it up and play some notes…. provided the thing works to begin with!! Once you get some basic notes down, you can then have fun bending notes with your left thumb under the EWI3000. With your right thumb which is on the rollers underneath, you can slide between octaves. If you have a cool synth bass sound it is easy to create an arpeggio or a wobble like bass sound. If you get two or three notes that you like, you can easily create a bass line and add expression with your breath, tongue, or pressure on the mouth piece. Trills are simple and by blowing hard or softly you can get some cool effects. I mean, you can really get some creative results using a Wind Controller like this. It’s addictive too and you have to be careful to take a break or else you’re thumbs will get stiff and your mouth will get sore…laugh. Geez, after I put my Wind Controller down I just about cramped out. I walked away like a zombie I was having so focused and having fun. I am no Sax player nor will I probably ever be one simply because it takes years like everything else to master. ( I prefer the keys and guitar, not to mention I also sing. ) However, it doesn’t take much to learn a few notes and scales on a Wind Controller so you can have fun getting creative with such a device. If I find a used Akai EWI4000s, I’ll probably jump all over it. The EWI4000s can use batteries, has internal sounds, and connects to other synths via MIDI. It also has a headphone jack so you could literally take it on the plane with you. How neat would that be? The AKAI EWI3000/EWI3000m combo is FANTASTIC!!! I absolutely love the sound and as a synth keyboardist, the presets are far from cheesy. I’m glad I didn’t buy the Patchman EWI3000 pathces because programming this synth is not that hard and it really does rock as is!! In no way does the EWI3000 clone a real sax, flute, or clarinet for example. This is a synthesizer and as a result you get nothing but excellent synth sounds. It’s fun now to be able to take out the AKai EWI3000 and create a bass line or a synth chord riff ( Yes it plays chords! ) and get creative results. You don’t have to be a pro wind instrumentalist much like you don’t have to be a pro keyboardist to create that catchy synth hook. You just need to “think outside the box” a little. EnjoY! About a week ago I stumbled upon a used Ensoniq SQ-80 at the downtown used music shop called “Hard Off” here in Japan. The hard shell case was dinged up a bit and I didn’t know what was inside, but it said Ensoniq on the outside. At first I thought it might be an EPS sampler of sorts. I have never seen either an ESQ, VFX, or ASR-10 series keyboard in any used store, so I was pleasantly surprised when I saw it was an Ensoniq SQ-80. The condition of it was really good with only one exception which was the door or lid of the floppy drive was missing. Other than the power cord there were no disks or other accessories. This was my first time both seeing and playing an Ensoniq SQ-80, so I quickly checked the web with my iPhone in the store to get more info. It seemed to have positive reviews and definitely not all that common “in Japan”. So I dragged it up to the front desk and asked to give it a whirl. Immediately there was this patch that I played that sounded almost EXACTLY like the sync patch sound in the Cars “Let’s Go”. Now I know the SQ-80 was not the synth used on that record, BUT, it was very convincing nonetheless and it sounded just plain cool! What I also liked was how responsive the modulation wheel was. I could pump out a bass line and modulate it into some funky electro riff. It was instant fun playing the SQ-80 and I knew right then I had to take this thing home. In total, the sales clerk allowed me to have it for $100 USD. I thought that was a pretty good price. I believe he reduced the price because he thought the floppy drive was broken. Later I found out that it was in perfect working order and just the front door piece was missing. The previous owner probably used the floppy drive quite a bit and it broke off or something. Not sure. A couple of notes. I tried the sequencer and thought it worked very well. You definitely can create some interesting 80’s oriented stuff with the sequencer for sure. It was pretty easy to record a pattern, loop it, and add tracks which was fun. It’s not a loop sequencer, but it comes close. I need to fine the Ensoniq CVP-1 Expression Pedal as nothing worked from either Korg, Yamaha, or Boss. Not event he Boss EV-5 worked at all. The Ensoniq appears to be very picky with what Expression Pedal it takes. I’d like to use it to control the modulation wheel so I can keep both hand on the keys. I just love that MOD wheel with some of these SQ-80 bass and Sync patches. I also was able to send patches to and from the SQ-80 with ease using Sysex Librarian on my Mac G4. Some patches I found on the web had the extension .MDX, but I found that if I simply changed that to .SYX, SYSEX Libarian would load and transfer the patch bank just fine. So I guess .MDX is the same as .SYX for at least transferring patches. There are some great patches to be found on the web and apparently you can also use any of the ESEQ-1 patches as well. I was surprised a little to see that there were still many commercial patch sets up for sale. With a synth this old, I generally encounter free patches, but it seems the SQ-80 is still in demand, so patches are still priced at a premium. There are also cartridges available, but I found having a working Floppy Drive to be sufficient. The prices on these cartridges for all Synth Brands are crazy these days. All in all, the Ensoniq SQ-80 was a fantastic purchase. I also have the Ensoniq EPS Classic and love that sampler as well. Ensoniq makes great stuff and I’m pretty excited about the SQ-80 and EPS combo. They definitely make a unique and wonderful sound.